Younger Daughter had a fiddle recital in Spokane last Friday. 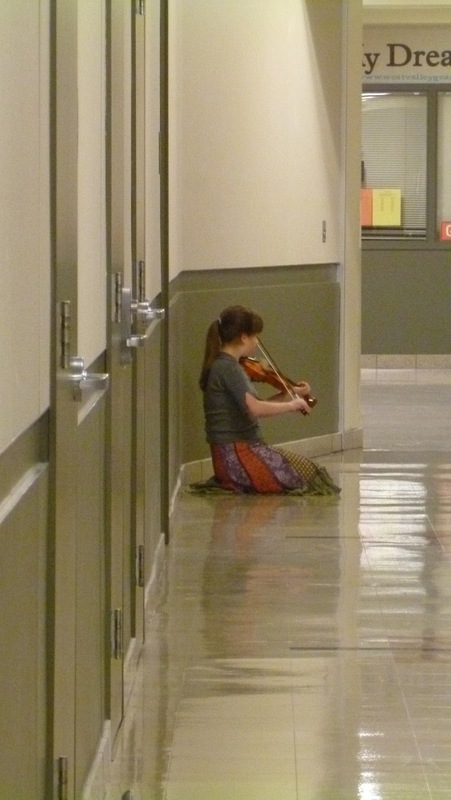 Her teacher and his wife have a small music school, and all the students participated. Fiddle is their specialty, but they also teach guitar, piano, and mandolin. Here are some of the kids warming up in the hallway behind the stage (it was held at a high school auditorium). A chaos of cases. I thought this photo turned out pretty neat. 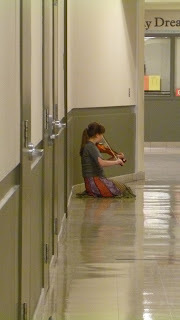 Here's Younger Daughter, nervously warming up by herself at the end of a hallway. At last it was Younger Daughter's turn. She was scared spitless but played beautifully. What a kid! 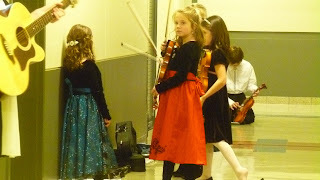 Fiddle? As in Blue Grass? Love that sound!! 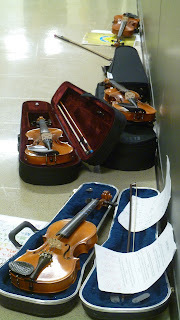 Violin, as in orchestra, not my favorite imstrument. Younger Daughter overcame her nervousness and played like a pro - way to go!! As for myself, I was a bassoonist. A more ungainly instrument doesn't exist - but the sound is deep and mellow and comforting. Like the voice of a good man whose arms are wrapped around you when you're sad. For some reason unknown to me, I have neither a good man nor a bassoon now - hmmm, this deserves some contemplation. Caio. Performing well while nervous is an important skill. 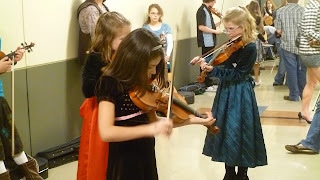 I always encouraged my students (and now my children) to perform as much as possible. I find that successful performing (and I don't mean "note perfect" only) will lend the confidence to become a successful public speaker. In fact, while younger, I had all the confidence in the world...as long as I had my flute in my hand! I do find public speaking much easier now. It could be age (lol), but I think a lot of it is my approx. 30 years of performing. I absolutely hated playing by myself! 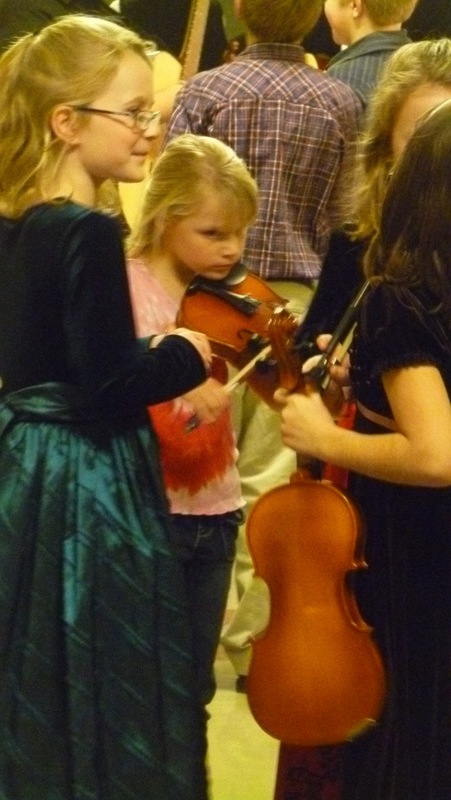 It was so bad that I very rarely ever practiced at home, unless I could get my sister to play along. I played flute/piccolo and she played Alto Sax. Encourage your girls to keep their instruments and keep playing! I wish I hadn't let my skills slide as much as I have. 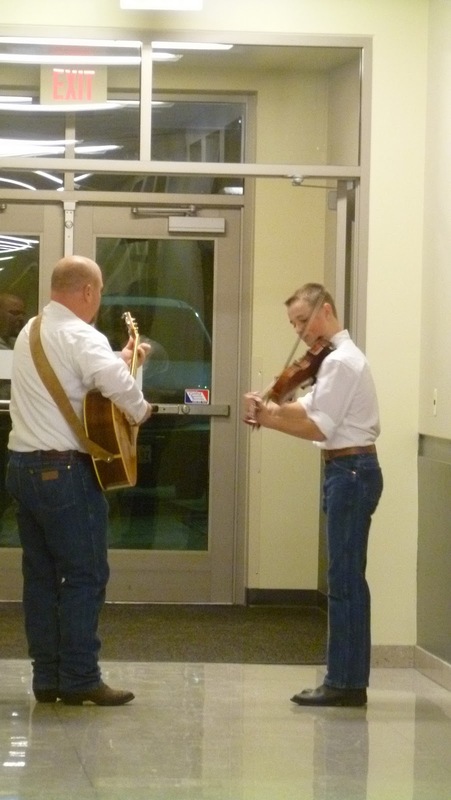 Keep playing and never pass up a gig.